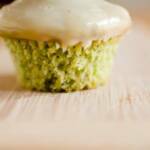 Prior to making my sweet pea and ricotta cupcakes, I'd never had peas in a dessert. In a medium-sized mixing bowl or bowl of a stand mixer, mix together cake flour, ground peas, baking powder, baking soda, and salt. Add the sugar and mix until well combined. In a small mixing bowl, whisk together eggs, ricotta cheese, and oil until smooth. Bake for 16 minutes and then test to see if they are done. They are done when a toothpick comes out without wet batter stuck to it. Beat cream cheese and butter on high speed until light and fluffy. Optionally, top with candied peas.